Out with the sandpit and in with the growlers; beer drinkers rejoice. There's a new local brewery-restaurant-bar-beer garden coming soon to 1115 East-West Highway. Started up by local Downtown Silver Springers, this is just what the neighborhood has been thirsting for. Emily Bruno, co-owner of Denizens Brewing Co., tells us a more about their upcoming venture. Can you explain your overall concept? It sounds like you'll be brewing your own beer in house? Denizens Brewing Co. will bring the craft beer tradition, style and expertise to Silver Spring in an urban brewery setting. We will serve traditional European-style lagers, American-style ales, Belgian-inspired beers, and sour beers, and our customers will be able to drink beer right as it is produced and ask our staff questions about it. We’re also partnering with a restaurant to offer a full menu making Denizens a food destination in Silver Spring as well. The location at 1115 East-West Highway is ideal - we will have a comfortable outdoor beer garden, seating for dining in the space upstairs, and a bar downstairs where the brewing takes place. Between having three spaces for drinking and dining and a diverse food and beer menu, we will have something for everyone in Silver Spring. Do you own other restaurants in the DC Metro area? 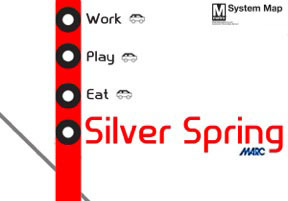 Why Downtown Silver Spring? Denizens Brewing Co. is a start-up brewery, although our brewer has years of experience in the industry in the Pennsylvania and Colorado craft beer scenes. After years working as a head brewer, he is founding his own brewery in partnership with Silver Spring locals who are also residents of downtown Silver Spring. Follow us on Facebook and Twitter for announcements of our brewer and restaurant partners over the next few weeks! What type of food can we expect on the menu? Our menu is currently being developed and we plan to serve seasonal food that pairs well with our beer and also accommodates the different settings for drinking and dining. We plan to have full courses if customers want a meal and also serve smaller plates perfect for sharing. Will you only carry your beer or have other beers available as well? Denizens will provide a top-notch alcohol menu for our customers. We will carry our beers, including our flagship beers that you will be able to find at other bars and restaurants throughout the region, as well as specialty beers that you will only be able to drink at our brewery. We will occasionally have guest taps open to breweries we like from across the country, but Denizens beer will be the main focus. While we think everyone can find something they love among the many types of craft beer we will produce, we will also have a unique mix of wines and liquor available, with a particular focus on craft distilleries from our region and local wineries. Will we be able to buy your beer "to go"? Our customers will be able purchase and fill growlers at our bar. So you can have a taste of several styles, drink a pint with your friends, and then take a growler home for later. Thanks for keeping us informed! I might be able to get some of my orange liners to hop on the red every once in a while if you keep this up!